Last night (Thursday) I was transported to another world. Figuratively speaking, obviously, but in my head, in my heart, I was somewhere other-worldly, somewhere special, somewhere captivating. I’m talking of Hamlet. Honest-to-god, Shakespeare as it’s meant to be, simple, complex, absorbing, brilliant: Hamlet. Unable to get to the ‘real’ show in London, we settled happily for the Next Best Thing that is the National Theatre Live – a local playhouse in Tunbridge Wells, the Trinity Theatre, became our Barbican, our gateway into this other world, and we saw, second-for-second, sweat-for-sweat, Hamlet streamed Live from the boards on which it was trod. Benedict Cumberbatch as Hamlet was the most convincing I’ve ever seen performed, and his portrayal of this troubled and undoubtedly iconic character was utterly sublime. I’m not given to sycophantic flim flam, but I was blown away by his performance. From the moment the curtain comes up on our tragic hero, the audience is drawn into his heart and carried along with him. 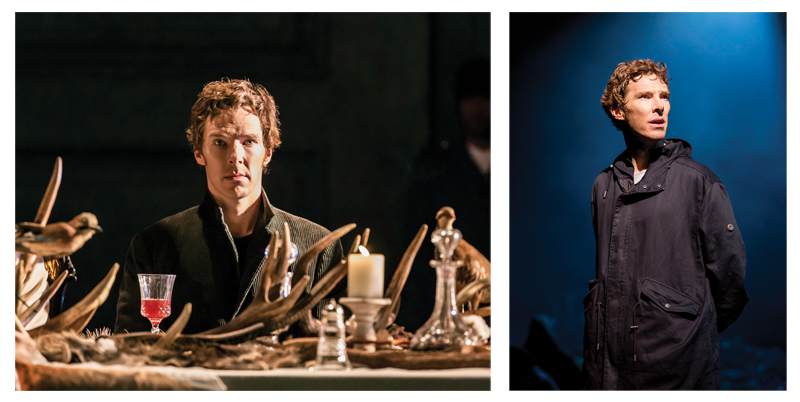 Hamlet’s ‘madness’ is often portrayed incorrectly as just that – madness. Almost giving credence to his uncle Claudius’ attempts (played here by Ciarán Hinds) to discredit his nephew by misrepresenting him as consumed by insanity. What he is, in fact, is exhausted by grief and conflicting loyalties, and Benedict’s portrayal is sensitive to the truly human aspect of this – that such expression of anguish is not the sign of a mind unhinged, but that such a conflict of emotions can still belong to a grounded soul. The haunting melody of Nature Boy is a recurring theme throughout the play, as we open on Hamlet grieving his father’s death and his mother’s almost immediate betrothal to his uncle. Made famous first by Nat King Cole, and revisited by the likes of Frank Sinatra and David Bowie (Moulin Rouge) throughout the years, it was a perfect choice for this modern interpretation of one of William Shakespeare’s most performed plays. Streamed live to theatres and cinemas around the world, last night’s broadcast of Hamlet is apparently the highest grossing cinema opening of 2015. That, might I say, is not bad at all. The star-studded cast lends weight to this oft-quoted and longest of Shakespearian masterpieces. Sian Brooke as Hamlet’s beloved Ophelia is entirely believable, her hands belying her grief and confusion brilliantly. Hamlet’s mother Gertrude (Anastasia Hille), Horatio (Leo Bill), Laertes (Kobna Holdbrooke-Smith), and Hamlet Snr’s ghost and the Gravedigger (Karl Johnson) – and more – made for even more substance. Most critics are raving about Lyndsey Turner’s directorial interpretation of Shakespeare’s original play, others criticising unnecessary script changes and general ‘shouty’ performances, but I feel the latter are being pedantic. If Shakespeare is to be reachable by a wider audience, then interpretation must be acceptable. We have children, and short of re-performing the whole play, I tried to share with them today what we had felt last night. Certainly my seven-year-old daughter wants to go immediately to The Barbican to witness this confusion of tragic consequence, and quite possibly two teenage boys might consider Shakespeare if Sherlock Holmes is anywhere on the scene. My four-year-old son’s opinion is still out for consideration, but would probably involve Lego or Spiderman at some stage in the performance. In short: we loved it. And now, to sleep, perchance to dream.